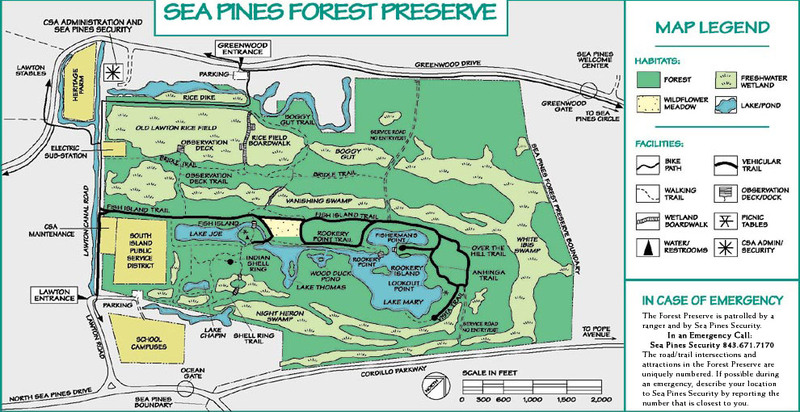 Today I want to tell you about the 605 acre Forest Preserve located within the Plantation. Fishing, hiking, wildlife viewing and picnicking opportunities galore and the Wildflower Field is a “must see” in the spring. You can also visit a 4000 year old Indian Shell Ring, listed on the National Register of Historic Places. The first trails in the Preserve were constructed in the early 1970’s and followed ante-bellum rice dikes, originally built by hand around 1840. Bridle paths, wetland boardwalks, observation decks, bridges and fishing docks were later added to improve visitor enjoyment. Between 1968 and 1980 several ponds and four lakes were dug. The lakes, named Lake Joe, Lake Thomas,Lake Mary, and Lake Chapin are the largest open freshwater resources on the island and are home to fine fishing and bird life. The Forest Preserve is open to visitors from sunrise to sunset. Boats must be registered annually with the Sea Pines Security Office. They may be powered only by electric motors and stored only on Fisherman’s Point. The picnic area on Fish Island is equipped with a shelter,picnic tables,grills,drinking water, and portable toilets. 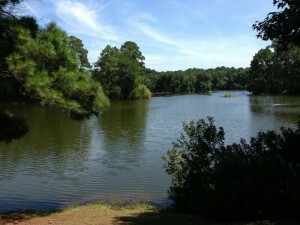 No swimming is permitted in any of lakes or ponds in the Preserve.